The archival research I conducted in 2014 and 2015 thanks to the support of the Institute of Nautical Archaeology is finally paying off. One of the objectives of the Twelve Apostle Project is to reconstruct the history of these 12 galleons as well as to determine what happened to them. The information about these vessels is often fragmentary and, sometimes, even contradictory. Therefore, being able to examine the original manuscripts that provide information about them is decisive to reveal the real history of these famous galleons.That is the case of the “Apostle” San Bartolomé. The General Archive of Simancas (Spain). This galleon was built by Agustín de Ojeda in the shipyard of Deusto, in the north of Spain, between 1589 and 1591. In 1596, it took part in the Armada sent to seize the port of Brest in Brittany (France) although a storm scattered the fleet near Cape Finisterre in northwest Spain, sinking more than 25 ships. The following year, another Armada was prepared to invade England and the San Bartolomé was chosen to transport 50,000 ducats to pay the troops because it was one of the strongest ships of the fleet. However, another storm prevented the fleet of reaching its objective. According to original documents, the San Bartolomé managed to return to Spain although it sank shortly after its arrival. However, its loss has been associated with different locations that include the Bartholomew Ledges in St. Mary’s Sound in the isles of Scilly (England), and the inlet of Viveiro in Galicia (Spain). 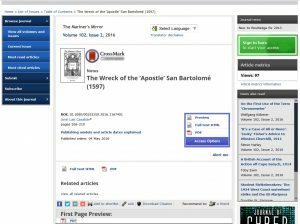 However, this discrepancy about the location of the wreck of the San Bartolomé has decisively been solved through examination of a series of unpublished documents held in the General Archive of Simancas (Spain). Although the San Bartolomé arrived badly damaged to the inlet of Viveiro, it did not sink there but somewhere else. Moreover, its loss was the result of a series of unpredictable and uncommon circumstances. More than 300 lives were lost and only 40 people survived. The King’s money was also lost as the chest with three locks that contained the 50,000 ducats was found empty. View of the inlet of Viveiro from the sea. For a long time, it was thought that the San Bartolomé sank here. Next week, we will talk about another “Apostle”.